Published July 29, 2016 By Leisa Good This post may contain affiliate links. Regardless, I only recommend sites I've researched and/or used and trust. Do you want to work for a call center as an at-home employee instead of an independent contractor? Do you still want to enjoy flexibility and setting your own schedule? Do you want to work for one of the oldest, most established remote call centers? Then allow this article to introduce or reintroduce you to one of the largest and best known work-at-home call centers. I am referring to Alorica. What Is Exactly is Alorica? The name, Alorica, may not sound familiar to you—especially if you have been working from home for a while. This company is the former West at Home or more commonly known as West. West was initially founded in Omaha, Nebraska in 1986 as a brick and mortar call center. However, during the early 2000's and with more adaptable technology, West began offering remote agents the chance to work from home. During these many years of offering legitimate work-at-home opportunities, West emerged as a leader in the work-at-home call center community. In 2007, West went from offering remote opportunities to independent contractors to making these individuals work-at-home employees. In 2014, West merged with Alorica. While some of the former West clients, such as HSN and Pizza Hut stayed on when West became Alorica, others left. However, there are a few new clients such as GE Home Delivery. Does Alorica Hire in Other Countries? This company only offers their opportunities in the United States of America. Alorica also does not hire in all states, so before planning to work for them, make sure that they hire in your state. 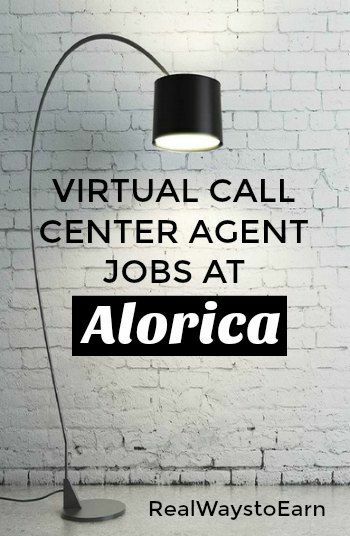 You will basically be a part-time employee for Alorica. Alorica does offer the opportunity to take advantage of medical and dental benefits from an approved third party provider. Then there are the obvious perks of working from home such as not having to commute and not having a dress code. What Are the Equipment Requirements to Work at Alorica? You must have a landline phone with no added features. You must have a noise canceling headset. You must have high-speed Internet. You must have a quiet place to take calls. You can read the full list here. Once you are accepted and your background check comes back without anything questionable on it, you will begin your training. You can also request a copy of your background check be emailed to you. What is Training Like at Alorica? Training will depend upon the client that Alorica offers to you. Training can vary from 2 weeks to 6 weeks on average. Training will be a combination of self-paced modules and virtual classroom. Training is paid at your state's minimum hourly wage. Once you complete training, you will be able to set your own schedule with the hours that are offered. What is the Pay Like at Alorica? As the clients vary, so does the pay. For the most part, agents earn $8.50 to $9.00 an hour with the chance on some of the calls to earn incentives and bonuses. Both inbound and outbound calls are offered with both sales and customer service-type calls offered. Some clients offer hourly pay while others will only pay “talk time” or the actual amount of time you spent talking on the phone during that hour. However, just like West did, Alorica will guarantee you at least your state's minimum wage if your hourly rate (due to talk time) falls short. Payday is every two weeks via direct deposit or paper check. What Do Others Say About Alorica? Opinions are as varied as the products and clients the company has. While some agents absolutely love it and have been there for many years when it was originally West, others do not like it. Some have even complained of being let go after many years of service and are uncertain why. Overall, most who do work for the company seem to be pleased with the job. You can certainly read the ratings and opinions given at both Glassdoor and Indeed. How Can Interested Individuals Apply to Alorica? Go on their website and get started on the application process today. Good luck to all who apply. I remember West At Home…I didn’t know about the change. Thanks for the review. Passing this along. @Cori – As always, you are welcome and it is a pleasure.